Discussion in 'Digital Photography' started by kallisti, Apr 30, 2014. I've been using Flickr for years to post pics to this forum. Recently Flickr changed and it became more of a PITA to get the appropriate link to post pics here. Just noticed today when posting that my only option for linking a pic was for a "medium" size export at 800 x 532 pixels--the "large" option wasn't available even though the uploaded image was considerably larger. Preferences on the Uploader app are to "Don't resize my photos." Tried changing this to "2048 pixels" without any success regarding exporting options. Am I doing something wrong or missing something? 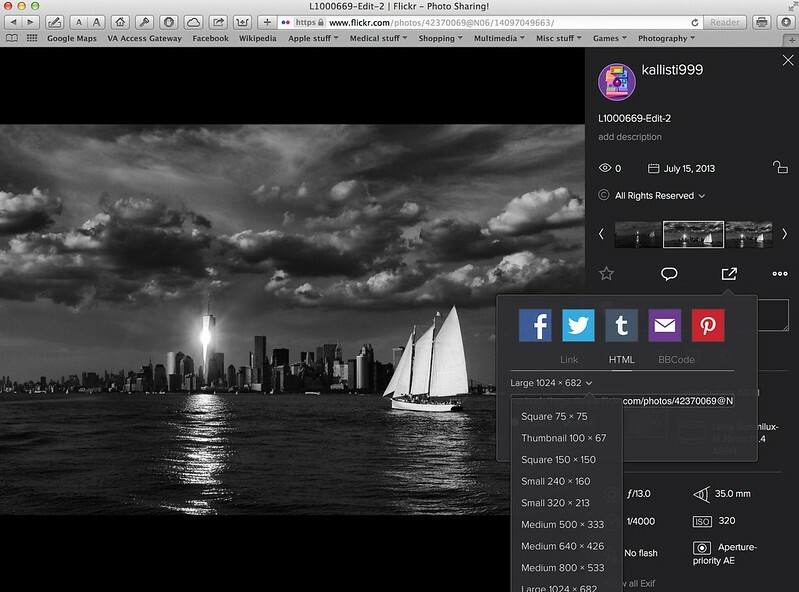 Has there been a change in Flickr that nerfed exporting large images? Should I switch to another service to still be able to post "large" images here? You have to change the size in the drop down first. Another thing that I have noticed seems to be broken with the new Flickr's BB share link is that if you directly copy and paste it, it will try to put the title in line with the photo. You have to add an extra line break before the title hyperlink to make it display below properly. (Using thumbnail size for my example below to keep it from being too big of an example). You can also just delete that line for the "Clean Look"
Quite so Dale, and I often do. I was mostly just pointing out that the current implementation is broken and needs to be "fixed" in some way when posting. Completely deleting that line is certainly a way to fix the problem. Everything is broke. ImageShack is no longer free. Flickr won't make up it's mind, but at least it still has good free features. Most everything in the tutorials no longer applies. Thanks for the tips you have posted. They are appreciated. I did use the drop down menu. For some reason when I was doing this yesterday, the largest option in the menu was medium. The uploaded image was easily large enough for a larger file size link (I.e. Large). Imported the image several times to Flickr, but never saw a drop down option larger than medium. It's buggy like that. The last couple of months Flickr has been a bit flaky in terms of interface consistency, but it seems to be getting better day by day. For me it stays on large now, where as before it was always medium. It's not a big thing, but I like the fact I don't have to change it each time. Bizarre. I went back today and it is giving me an option for a large file size on the images that prompted this post. Strange. I'm wondering if it was a browser issue with the site that it wasn't letting me scroll down to the other file sizes. Flickr have been making a few changes recently - maybe your initial attempt was during one of their changes.